As many of you know, my daughter Katie has Cystic Fibrosis. Katie was diagnosed with CF on September 30 2008. She was 17 months old at the time. On Sunday May 30 2010, the Canadian Cystic Fibrosis Foundation will be hosting the annual Great Strides walk for cystic fibrosis. We will be walking and invite you to join us for this annual event. 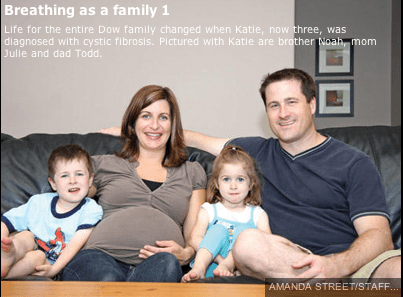 Please watch our video, Katie – Great Strides 2010, which provides a window into our world. While life span has improved for patients with CF, quality of life is still an issue. Daily treatments, medication, clinic visits and health challenges are always present. When Katie is healthy, we do two treatment sessions a day with her. When she is sick (cold, flu, etc. ), we do three or four treatment sessions with her. Each year, on the last Sunday in May, friends, family and co-workers of people with cystic fibrosis participate in “Great Strides”, which is the Canadian Cystic Fibrosis Foundation’s largest national fundraising event. Walk with us on Sunday May 30 2010. We just read your family's story in this evenings Grimsby News and our hearts go out to you – we've been struggling a very similar battle this past year with our two year old son. The pictures of the sweat test machine and 3F clinic at Mac bring tears to my eyes. My husband and I were both in tears after reading your story. We've joined Team Katie and the little guy will be lacing up his walking shoes to join in the Great Strides Walk on the 30th. If Katie was my baby, I'd be giving her a dose of cinamon and honey on a three times a day schedule. You can make it in tea, or just have her lick off a teaspoon. Give her plenty of fluids. Check Cinamon and Honey on the Internet. You can contact me at sandrajugoon@hotmail.com Cloves is good too. It kills the virus that causes mucus in the lungs. It worked for me. Start with very small doses. You might be amazed at the results, and for sure, Katie will.